1. Gill IS, Desai MM, Kaouk JH, et al. 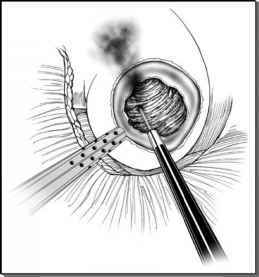 Percutaneous endopyeloplasty: description of a new technique. J Urol 2002; 168:2097-2102. 2. Gettman MT, Ncururer R, Bartsch G, et al. Anderson-Hynes dismembered pyeloplasty performed using the da Vinci robotic system. Urology 2002; 60:509. 3. Hsech K, et al. Hand-assisted laparoscopic suturing: reconstruction. J Endourol 2004; 18(4):374. 4. Eichel L, Khonsari S, Lee DI, et al. One-knot pyeloplasty. J Endourol 2004; 18(3):201-204. 5. Chen RN, Moore RG, Kavoussi LR. Laparoscopic pyeloplasty-indications, technique, and long-tern outcome. Urol Clin North Am 1998; 25(2):323-330. 6. Bauer JJ, Bishoff JT, Moore R, et al. Laparoscopic versus open pyeloplasty: assessment of objective and subjective outcomes. J Urol 1999; 162:692. 7. Gill IS, Kaouk J. Laparoscopic reconstructive urology. J Urol 2003; 170:1071. 8. Gupta M, Smith AD. Crossing vessels at the ureteropelvic junction: do they influence endopyelotomy outcome? J Endourol 1996; 10(2):183-187. 9. Pardalidis NP, Papatsoris AG, Kosmaoglou EV. Endoscopic and laparoscopic treatment of ureteropelvic junction obstruction. J Urol 2003; 168:1937-1940. 10. Marcovich R, Jacobson Al, Aldana JPA, et al. Practice trends in contemporary management of adult ureteropelvic junction obstruction. Urology 2003; 62:22-26. 11. Peters CA. Laparoscopy in pediatric urology. Curr Opin Urol 2004; 14(2):69. 12. Liatsikos EN, Dinlteno CZ, Bernardo NO, et al. Endopyelotomy failure is associated with reduced urinary transforming growth factor-beta 1 levels in patients with upper urinary tract obstruction. J Endourol 2001; 15(6):567-570.